One strategy for saving the tiger is to recognize subspecies, which are populations of the species that are recognizably different, either genetically (usually through inspection of DNA sequences) or through morphology (morphological differences, of course, often reflect genetic differences). Subspecies used to be called “races,” and still are by some people, but the term “race” is now in bad odor because of its past misapplication to our own species. The designating-subspecies strategy here is two-pronged, with one prong scientific and the other political. The scientific rationale is that because populations differ genetically, saving different populations that are genetically diverse is a way to conserve overall genetic diversity in that species. Why? It’s sometimes not clear, but reasons given are to enable the species to recover if populations go extinct from inbreeding (a loss of genetic diversity), to conserve populations that look different and thus could be considered to have diverse appeal, and to save rare alleles that might prove adaptive under environmental change. I consider this strategy ill-conceived for reasons I’ll mention below. The political reason is simply because some conservation laws, like the U.S.’s Endangered Species Act of 1973, allow a population to be listed as threatened or endangered if it’s not an entire species but simply a subspecies: a genetically different population. If you want to save a species, then, one way is to help save its constituent subspecies, regardless of the genetic rationale above. All that’s required is that a population be designated a subspecies because it is genetically different from other populations, and then that subspecies cannot be touched. Exactly how different a population must be to be regarded as a subspecies is not clear, and is subject to discussion and argument by biologists. The use of the “subspecies” category thus gives conservationists a way to save species by saving their populations, even if the genetic rationale supporting it is weak. But because most conservationists and many biologists, including me, see saving species as an intrinsic good, regardless of genetic differentiation, we can use the “genetic differences” regulations as a way to do what we really want to do: save species as wholes regardless of how genetically different their populations are. And that surely holds for the vanishing tiger. In other words, it’s in the interests of species-loving biologists to designate as many subspecies as possible as a way to save species, regardless of whether we agree with the “saving genetic diversity” argument. (As I said, I don’t really buy into that argument.) Thus you can use even tiny genetic differences, perhaps as little as a single gene causing change in, say, color—or even a diagnostic difference in DNA sequence of unknown function—as a way to designate subspecies and thus save species. Now some biologists do think that we need to conserve genetic diversity within a species, and sometimes they might be right. But more often I think it’s a tactic to enable them to do what they feel impelled to do: stave off the destruction of threatened species by any means possible. I hasten to add, though, that investigating population differences is of interest in its own right. For instance, we can get an idea whether those populations might be reproductively isolated (no gene exchange because of biological differences), and thus true species rather than subspecies. Or the genetic differences might give us some idea of the history of the species and the evolutionary relationships among populations. Or you might be able to identify illegal wildlife traffickers by looking at the DNA of material they’re selling. An increase in tiger subspecies—or rather, a genetic confirmation of traditional subspecies— comes from a new genetic survey of the world’s tigers by by Yue-Chen Liu et al., just published in Current Biology (paper here, pdf here; reference below; ask if you can’t get it). There’s also a summary of the study in this week’s New York Times (click on screenshot below). Tigers are genetically depauperate, probably because of a reduction in species size to around 50,000 during Pleistocene glaciation. Nevertheless, sequencing of mitochondrial and nuclear DNA of tigers shows clear genetic differentiation among populations, and the well-demarcated populations (genetically, not morphologically) correspond to the six subspecies already recognized: the Bengal tiger, the Amur tiger, the South China tiger (only one specimen used), the Sumatran tiger, the Indochinese tiger, and the Malayan tiger. Gene flow among populations was extant but low, reflecting the fact that they’re geographically isolated and have been so for some time. They aren’t considered different species because there is some gene flow and because hybrids, at least in captivity, are readily formed and are fertile. These differences aren’t so readily discerned using morphology, since tiger subspecies generally lack diagnostic physical traits, though there are some average differences in size, shape and color (see here for a summary). That is, you can’t unambiguously put a single tiger into one of the six subspecies using morphology alone, but you can do it using just a few genes. Because many of the conservation policies and measurements regarding the tiger, including coordinated captive breeding programs and legislations in several tiger range countries, are based on “subspecies taxonomy,” an appropriate description of subspecies is vitally important. 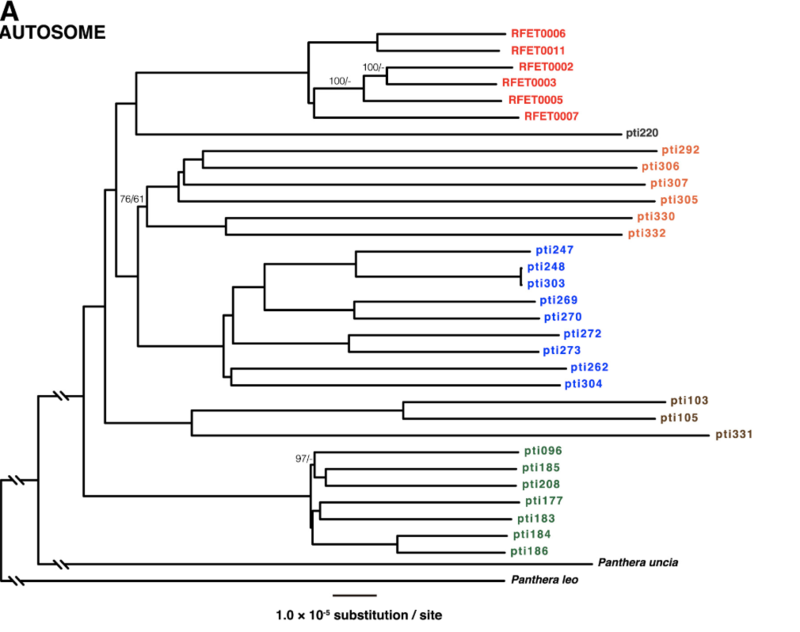 Considering the subspecies concepts presented above, the genome-wide signatures of phylogeographic partitioning and evidence for long-term restriction of gene flow and adaptive divergence jointly allow us to elucidate tiger evolution and corroborate six phylogeographic units. These findings provide the strongest genetic evidence for subspecies delineation in tigers to date, evidence stronger than that used to define subspecies in nearly any felid reported thus far. These population units correspond precisely with the geographic subspecies named much earlier. 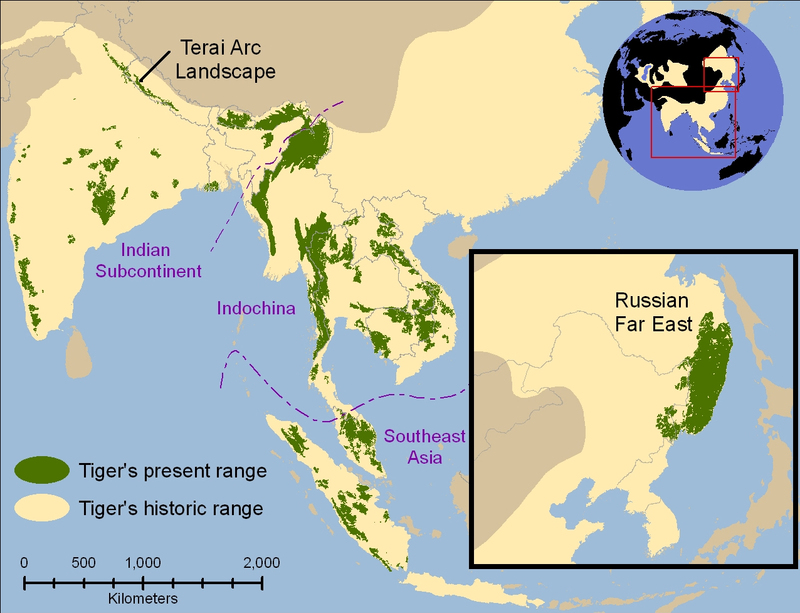 . .
Understanding the tiger’s natural history from a genomic perspective provides a data-driven foundation for subspecies recognition, conservation strategic planning, and management actions. Our general goals are to reverse the species’ decline by maximizing the efforts to preserve the genetic diversity, evolutionary uniqueness, and potential of the species Panthera tigris. The New York Times article echoes the conservation importance emphasized by the study’s authors. But, as I implied above, recognizing six subspecies rather than two is important mainly because it gives biologists a legal handle to save tigers in general. The genetic differences between populations, as diagnostic as they are, are in my view not sufficient reason by themselves to save all populations. Sufficient reason to save the populations, though it won’t fly with governments and laws, is simply because we need to save as many tiger populations as we can, because they add to our world, because they were here before us, and because we have no right to wipe out a dwindling species for our own selfish needs. Despite their fierceness, tigers can’t fight human development. Most nature-loving biologists simply want any way to save tigers, and genetics (again, this is my opinion) gives them an excuse—but not a good population-genetic reason. Any one population of tigers surely contains enough genetic variation to replenish all the other populations, whether that variation be common or rare. And, of course, new mutations occur. A system recently proposed by some scientists that would classify the world’s tigers into two subspecies would harm the world’s remaining tigers rather than benefit them, said Shu-Jin Luo, a geneticist at Peking University who led the study. Preserving what is left of tigers’ genetic diversity will require ensuring that all remaining subspecies are taken into account, she and her co-authors argue. No, tigers are not all alike; they differ on average in appearance, and in DNA sequence, some of those differences probably being the result of geographically varying natural selection. But what do we gain by saving subspecies because they have genetic differences. What, indeed, are the genetic differences we’re trying to conserve? Genes for morphology? Those differences are inherent within in any one subspecies, so you could constitute any extinct population simply by either selecting variants within another subpopulation, or transplanting members of extant populations to areas of extinction, where selection will act eventually to create a new subspecies (it may be different from the old one). Are we trying to save variants that might be adaptive in the whole species, enabling it to respond to new selective pressures? If so, those variants are probably latent in several populations, so you don’t need to conserve them all. Are we trying to prevent inbreeding? Well, there’s no evidence that extinction is caused by inbreeding in this species, and to save them that way requires crossing members of different subspecies, which wipes out the differences we’re trying to conserve in the first place. What I’m not saying here is that because the rationale for conserving genetic variation in tigers is weak, we shouldn’t try to save every subspecies. No, what I’m saying is that the genetic-variation excuse is a way that some biologists, chafing under legal restrictions, try to save every member of a species, no matter how many subspecies there are. Having six rather than two subspecies of tigers makes it easier to save them all, but what if the genetic variation analysis had shown just two, or four, distinct subspecies? Would it be less pressing to save tiger populations? I doubt that even conservationists would agree. And that shows that we’re using political rather than sound genetic rationales to save endangered species. My message here is just this: we should save all the tigers because tigers are an inherent good. If we have to do that by recognizing subspecies, well, that’s the way we have to do it. But we shouldn’t pretend that we need to save subspecies to “conserve genetic variation in tigers”. That rationale is very weak, and makes conservation dependent on subjective criteria like the frequency of DNA variants that may not even play a role in adaptation—now or in the future. I think it’s time for conservation geneticists to tell us exactly what kind of genetic variation they want to save, and why. (There’s very little written about this.) And it’s time for biologists to admit that for many of us, our interest is not in conserving genetic variation, but in saving every tiger possible. The subspecies ploy is one way to do that, but it’s still a ploy. The way to save tigers is not to designate subspecies and then use various schemes to conserve genetic variation, but to save the habitat in which tigers live and to keep people from poaching them. This entry was written by whyevolutionistrue and posted on October 29, 2018 at 10:30 am and filed under conservation, felids. Bookmark the permalink. Follow any comments here with the RSS feed for this post. Both comments and trackbacks are currently closed. Why “surely”? I would think genetic diversity is something that a species can never get enough of. The more genetically diverse a species is, the better it is able to withstand future environmental threats. Then we should save every individual, for who knows which rare alleles could be important in the future? Screw the subspecies concept if this is your view. Yes we should if that were the only criterion. I really wasn’t trying to disagree with your point, just verifying my understanding of the situation. While every allele is potentially important in the future, does not a subspecies represent a hint as to a pool of alleles that has already been selected by nature (or not deselected) and, therefore, it contains alleles worth saving? The importance of this would assume that what has been successful in the past will be successful in the future but that’s a pretty good assumption in the absence of additional knowledge. I remember a nature show that mentioned that the world’s cheetahs are all virtually identical genetically to the point where one can take skin from one and graft it onto another with no fear of rejection. It was surmised that the species had recently gone through a population bottleneck consisting of 100 individuals. This was perhaps 25 years ago so I don’t know if this estimate is still believed. Why would you assume this? It would mean assuming that evolution can’t, or at least shouldn’t, occur. Given that most species have only a few million years’ lifespan at the best of times, and that we are in a mass extinction (mammal megafauna died out at 12ka, and we quite clearly haven’t recovered), I’d believe that the exact OPPOSITE is true: that what worked in the past is likely to be catastrophically bad in the future. Secondly, biology’s a science. We can predict future conditions–perhaps not with 100% accuracy, but we’re not blindly guessing either. The fact that we’ve put forward essentially zero effort doesn’t negate the fact that it’s possible; it merely means that we dropped the ball. And before you say it, no, I don’t think this means running rough-shod over the ecosystem and doing whatever we want. All I’m saying is that 1) ecology is a legitimate field of scientific inquiry, one that can make testable predictions, and 2) we’re in a period of drastic change, and have been for a long time. You are misrepresenting what I wrote. I said “that’s a pretty good assumption in the absence of additional knowledge.” I was not campaigning for lack of knowledge, simply acknowledging we are not currently in a position to choose a subspecies and pronounce it most likely to succeed. If we have additional information that bears on an issue then we should use it. What you are suggesting can easily go wrong. How can scientists really test predictions in any practical way? Even if working with a small captive population shows us something, can we really be confident enough to let it guide what we do to the ecosystem at large? Even messing with mosquito genetics in the wild could have unintended consequences. I agree with the two numbered points in your last paragraph, especially #2. However, I don’t think that’s all you are saying here. Agreed. We don’t know nearly enough about how ecosystems work in order to do large-scale ecological engineering. What conservationists forget, however, is that preserving species is just as much ecological engineering as anything else. Preserving them can go wrong just as easily as picking which groups to perpetuate. The last stable ecosystem ended 12,000 years ago. Trying to preserve ecology at some arbitrary point after 12ka simply isn’t a viable solution on any reasonable timescale. I understand but they really aren’t equivalent. Helping a species survive in its natural habitat IS ecological engineering for sure but it doesn’t seem as disruptive as, say, introducing that same species into a habitat in which it has never lived. There are degrees of ecological engineering. For fans of this species, “The Tiger” (2010) by John Vaillant is a terrific read. Beside its page-turning account of the hunt for an Amur tiger that turned man-eater, it provides a fascinating, well-informed history and sociology of Siberia, and to some extent of Russia. Superb book. Beautifully written and observed, and will have you rooting for the tiger. Yes, I enjoyed that book immensely. Makes me think of Dersu Uzala. Precisely. Dersu’s employer, the explorer and geographer of Siberia Vladimir Arsenyev, provides a kind of symbol of Soviet history. His wife Margarita was executed in the Great Purge, and his daughter Natalia was sent to the GULAG. But, later on, the USSR named a town and a Siberia-based icebreaker after Arsenyev, and I believe there is still an Arsenyev Museum in Vladivoskok. There is also an asteroid, if I recall, Dersu-Uzala. Has this “ploy” been used to save other endangered species? I know elephants have many subspecies. It seems to me a significant way to save a species overall, even if it is unclear what type of genetic variation biologists are trying to save. I cannot pretend to grasp the details of genetics and the decisions behind splitting species into subspecies or into full species. I wish I understood it better in order to understand the articles I read on here (about giraffes, for example) or at TetZoo (currently featuring an article about the validity or not of the Tapirus kabomani) or Novataxa blog (recently featured the splitting of Micistops into M. cataphractus and M. leptorhychus). The problem with DNA analysis is that it’s limited. The Human Genome Project took years and numerous labs to complete; we simply don’t have the resources to do this with every species on the planet. Thus, we focus on the portions of DNA that are most likely to yield interesting results–just like morphologists have always done with morphology. I will also add that it is EXTREMELY rare that phylogeny can be considered complete (in my opinion, anyway) without including fossil data. Any time we speak of “ancestrial”, we’re talking about deep time, and in fact making a hypothesis about the fossil record. Trouble is, you don’t find a lot of DNA in the fossil record. Not past a certain point, anyway. There’s very good correlation between morphology and DNA phylologenies (see the evolution of baleens, for example), but still, since morphology is all we’ve got in the fossil record, we have to use it. Biologists get all kinds of upset when I say this, but I’ve yet to here a coherent argument against it. Most boil down to “We have more precise data for modern critters”, which is a non-starter for what should be obvious reasons. Further, DNA is pretty variable. You can have a wide range of alleles within a population. In fact, the theory of evolution demands this must be so–a population where all traits are fixed is doomed. Which means that DNA analysis is pretty complicated. You have to figure out the normal range of variation, for each population. Not an easy task. As a final thought: Morphology is a way to look at genetics, if properly analyzed. Morphology is based on genetics–you can’t get a six-legged tiger without a genetic component!–but it’s not simple. Each trait tends to be influenced by a suite of genetic data, across multiple chromosomes. So morphology is a good way to gather a lot of genetic data relatively quickly. Again, there’s very good correlation between (at least some) morphologic and genetic phylogenies; that’s because they are not independent of one another. This crosses with a subject that is to my mind a good example of humans deciding that some species are good & some bad. Ruddy ducks, Oxyura jamaicensis & White-headed ducks Oxyura leucocephala can interbreed. Ruddy ducks introduced or escaped from wildfowl collections in Britain began to migrate & interbreed with White-headed ducks, so the Ruddy ducks have been pretty much eradicated in Europe. That they can interbreed suggests that they are not separate species surely? The Ruddy ducks were ‘contaminating’ the gene pool of the white-headed ducks so were eliminated. If a pair had crossed the Atlantic on their own & started interbreeding, would that be OK? There will soon be more subspecies of tigers than there will be tigers, such is the power of sicence. I’m all for saving the tiger, but shouldn’t taxonomy be done for scientific reasons rather than conservation policy reasons? A friend of mine works as an engineer for Panthera, a big cat conservation organization. He helped develop a camera for anti-poaching programs around the world. The cameras are built to be very rugged and to endure jungle conditions. They also are capable of sending images back to authorities for apprehension of poachers. They have achieved much success in many areas of the world saving tigers and many other endangered species. 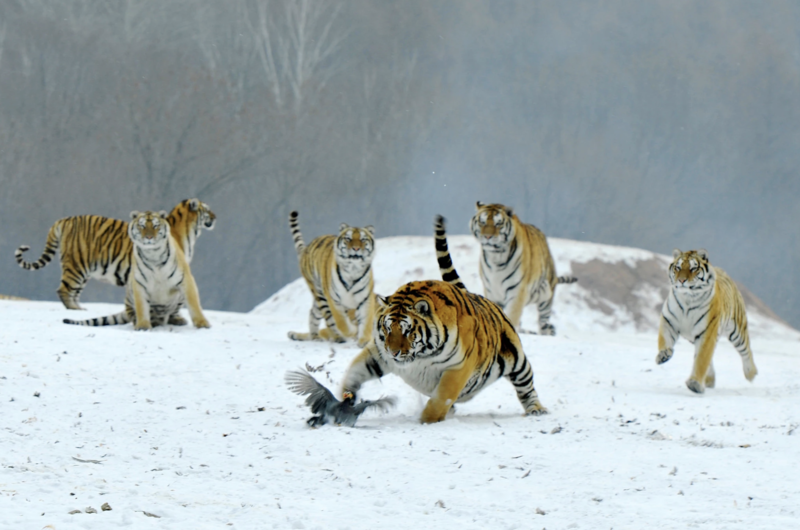 I mentioned Dersu Uzala above – would this work with the siberian tigers (who live in the taiga)? I’m not sure if the camera is designed for very cold environments. But, Panthera’s camera is used by many organizations around the world. It might be usable in Siberia. I have always felt the tactic of defining subspecies as a conservation tactic to be inherently dishonest. The question for biology is “What is the natural world like?” To politicize that question is to corrupt that mission–and if you’re defining subspecies, not based on the organisms themselves but on the political angle you’re trying to achieve, you’ve abandoned that mission. This can and does have real consequences. Secondly, I’m not convinced that in general being added to the Endangered Species List is a good thing for most organisms. I work in environmental compliance/remediation, and “Shoot, Shovel, and Shut up” is a very real thing. People are MORE willing to kill an animal–if they think they can get away with it (and it was our job in part to ensure they didn’t)–if it’s on the ESL than if it’s not, because if it is on the ESL it’s taking money out of their pockets. Those who have found endangered species on their property often in my experience feel that they have been victims of theft–the government took their land (or at least took complete control of it, which amounts to the same thing) without any compensation. Even Eminent Domain is more just than that. Doing so because a biologist subdivided a population and suddenly a species is endangered does NOT sit well with these people. I have sat in meetings (note the plural!) where contractors said “We’ve paid for X amount of take, so I don’t want to hear that production was slowed down due to seeing a [insert endangered species].” The contractors viewed the fines as nothing more than a bribe. That’s not protecting species; if anything, it’s having the opposite effect. I’m not saying we should abandon any attempt to protect endangered species. I’m just saying that scientists should be honest, and that our current methods have some very real problems–and that combining dishonest taxonomy with an inherently problematic and ineffective method of protection isn’t going to result in success. I agree with some of that, but strongly disagree with your second point. Like you, I have also worked for consulting companies and sat in on those meetings, and I ihave seen that the ESA was often used successfully to save habitat. Developers spent large amounts of money and political capital to fight new listings. Apart from the ESA, there is often no other tool available. To disparage the law because it is not perfect is to do a gave disservice to conservation. Our experiences have obviously differed. I’ve seen the ESA succeed; I’ve also seen it fail spectacularly. This is a very odd complaint to have about my post. I’m not disparaging anything; I’m pointing out widely known flaws in this particular law. The only new information in my post was my personal experience; even the name is something I picked up from cultural emersion. My point wasn’t to say “…therefore we should abandon any attempts at conservation”, but rather to point to real issues that we need to address if we want to have lasting success. If critical analysis of the shortcomings of conservation tactics not allowed, we may as well throw our hands up and admit defeat. Ignoring such issues is the best way I know of to ensure failure. I would also argue that the fact that we only have one tool in our toolbox is…well, insanely and suicidally stupid. It’s trivially obvious that no one solution will solve all problems, after all. Such a tactic doesn’t work in any other field of human activity that’s not directly tied to the primary physical forces. I believe that conservationists so focused on trying to make a handful of solutions work that they have blinded themselves to other options. All of this is exacerbated by the fact–which both you and I discussed–that there is active opposition to conservation. We’re not talking Captain Planet villains here, but rather people with very different values, but the result is the same: there are people who are very, very good at avoiding complying with these laws. If we only have one tool in our toolbox, it’s a pretty good bet that they will be able to easily out-maneuver us. I am not very familiar with how wildlife conservation works in the US but, if true,it seems astonishing that you have only the one tool in your tool-box as you suggest. Please re-read my post, and the one to which I was responding. I did not suggest that there’s only one tool in our conservation toolbox; Lou Jost did. I was commenting on that statement, and the mentality it implied. There’s a strong sense in the conservation world (again, in my experience) that only certain regulations will do any good. No other methods are discussed, much less implemented. And any change to those regulations–any at all–is considered horrific and catastrophic, as though that one regulation (be it NEPA, the ESA, or whatever) was the only option possible. From a tactical standpoint, if you find yourself with only one option, you’ve screwed up royally. And those pet regulations are demonstrably not the only options available. My argument is that we need to stop focusing on what has worked in the past, and start looking at how to effectively achieve the goal. Seems a little strong to call the subspecies tactic as “dishonest”. Unless I am missing something, no one is lying here. Naming subspecies for reasons other than biologically valid criteria IS lying, at least in my opinion. I hardly think it’s strong to hold science to rigorous standards; that’s supposed to be the whole point of the endeavor. What are these non-biologically valid criteria of which you speak? Isn’t the controversy over whether we should consider a species to contain multiple subspecies and, if so, how many? Subspecies may be a vague categorization but it isn’t lying. When biologists designate subspecies in an attempt to save a species, they are making biological claims based on POLITICAL criteria. They are using data as a mask to hide their agenda. I happen to largely agree with that agenda; however, that does not negate the fact that they are committing fraud. The only valid reason for designating a new subspecies is if there is a biological criteria for doing so. If it happens to assist in preserving the species that’s fantastic; if not, that’s something we need to be brave enough to deal with. Perpetuating numerous subspecies in order to achieve some ascientific agenda is no different from cherry-picking data in order to achieve such an agenda, as was done during the attempts to dissociate smoking and cancer. Even if you agree with the agenda–and remember, I largely do, and have risked my life to achieve it–this sort of thing is incredibly damaging. You want to know why Conservatives distrust science? This sort of thing is one reason. The biologists who perpetuate subspecies to achieve an agenda demonstrate that scientists do this sort of thing. How can we possibly say “Yeah, sure, we do it there–but not with these other controversial topics”? When someone doubting global warming reads how biologists make up new subspecies to achieve conservation goals they’re going to wonder (or be told to wonder) how much global warming data is similarly adjusted. The folks who are pushing against evolution can point to this as evidence that it’s all politically driven and arbitrary. It puts us on the defensive, because we in fact have violated our own principles. If you can’t see how all of that is a bad thing, I have nothing further to say to you on this topic. I value scientific integrity, both as a moral stance and a tactical one. If you’re willing to abandon it, or ignore the issues this practice raises about it, we have no common ground upon which to discuss this topic. The accusation that scientists are not applying subspecies criteria fairly makes sense but is it really the case? We have only your opinion as to the subject and scientists’ motivation. Even if they are fudging the subspecies categorization, I would hardly call that “political”. They are just trying to save as many creatures as possible given the rules politicians have set. IMHO, they can be forgiven for attempting to game the system, much as taxpayers game the rules to legally avoid paying taxes, but it is also fair for others to call them on it if they go too far. In no way is this issue equivalent to the denial of climate science. I don’t think there are biologically valid criteria for subspecies (or for any taxonomic unit other than species, for that matter), so I don’t think anyone is lying, unless the populations classified as subspecies lack any recognizable difference. I don’t know about mammals, but I think it is advantageous to protect genetic diversity of coding loci in plants. We know that plant species have variable, inherited adaptations to climate, with different sub-populations adapted to different local climates. In a world facing rapid multifactorial climate change, this diversity should help the species survive. I think this is true for any sexually reproducing species. I lived and worked in Dhaka, Bangladesh, between 1994 and 1998. One of the locals I worked with said that in 1957, when he was a boy, he saw a tiger walking in his neighborhood. He never saw one after that. I’ve often wondered what it would be like to live where tigers roamed.